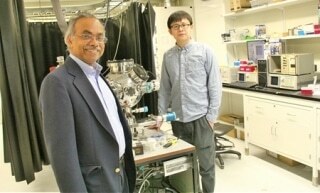 Department of Chemical and Materials Engineering professor Thomas Thundat, left, and PhD student Jun Liu have made a landmark discovery making huge improvements on the development of triboelectric nanogenerators. These devices could harvest mechanical energy such as vibrations or wind to power small electrical devices. This discovery puts forth a new world standard in devices known as triboelectric nanogenerators by developing a high-density DC current — a major improvement over low-quality AC currents generated by other research teams. Jun Liu, a PhD student functioning under the direction of chemical engineering professor Thomas Thundat, was performing research unrelated to these small generators, employing a device known as an atomic force microscope. It supplies images at the atomic level by using a small cantilever in order to “feel” an object, the same manner in which one could study about an object by just running a finger over it. Liu forgot to press a button capable of applying electricity to the sample. However, he still managed to see a current emerging from the material. I didn’t know why I was seeing a current. One theory refers to the fact that it was a technical problem or an anomaly, or interference. However, Liu wanted to get to the bottom of it. Ultimately, he pinned the cause on the friction of the microscope’s probe applied on the material. It is similar to shuffling across a carpet, followed by touching someone and then giving them a shock. It seems that a flow of electricity can be produced by the mechanical energy of the microscope’s cantilever passing across a surface. However, instead of discharging all the energy in a single burst, the U of A team produced a steady current. “Many other researchers are trying to generate power at the prototype stages but their performances are limited by the current density they’re getting—that is the problem we solved,” said Liu. This is big. So far, what other teams have been able to do is to generate very high voltages, but not the current. What Jun has discovered is a new way to get continuous flow of high current. The discovery explains the fact that nanoscale generators are capable of harvesting power for electrical devices based on nanoscale vibration and movement: an engine, traffic on a roadway — also a heartbeat. This could result in technology with applications found in everything ranging from sensors used for monitoring the physical strength of structures such as pipelines or bridges, the performance of wearable electronic devices or engines. Liu stated that the applications are restricted only by imagination. The U of A findings have been published in the most recent issue of the journal Nature Nanotechnology.